Here is a preview of the available Verizon cell phones for seniors and the Verizon senior plans 2019. The Verizon 65 plus plan is a nationwide plan and considered one of the common cell phone plans for seniors, Coverage is given by the reliable, high-speed Verizon's nationwide wireless network. The Verizon senior plan is designed to meet the older senior’s usage trends, seniors over 65 years old are usually not a big cell phone user and most of them don’t use the text message or the data services. So, Verizon wireless offers a low price voice cell phone plans for seniors with the ability to add text or data plans when needed. The Verizon nationwide 65 plus plan is a two years contract plan offered for the 65 and older seniors with no domestic long distance charges, and unlimited national mobile to mobile minutes to Verizon mobility customers. With the Verizon nationwide 65 plus plan you can have only the voice plan or add any of the available messages or data plans. The Verizon senior plan needs $35 as one-time activation. The Verizon senior plan offers two voice plans; the single line voice plan offers 200 anytime minutes along with 500 minutes available on nights from 9:00 PM to 5:59 AM and weekend for $30 per month. If you exceed the allowed minutes, you will pay 45¢/Minute as overage charges. The two lines, voice share plan offers 450 anytime minutes a month along with 1000 minutes available on nights and weekend from 9:00 PM Friday to 5:59 AM Monday for only $60 per month. Also, you will pay 45¢/Minute as overage charges in a case of exceeding the allowed minutes. Call Waiting, Caller ID, Call Forward, and Voice Mail. No domestic long distance charges. Unlimited national mobile to mobile minutes. The message plans are the same for both the single line and the two share line plans. You can pay per message, 20¢/Text Message or 25¢/Multimedia Message or get 1000 messages a month for $10 per month with 10¢/Message as overage charges if you exceed the allowed messages if you are messages big fan you can get unlimited text for only $20 per month. The data plans are the same for both the single line and the two share line plans. Pay as you go $2/MB. Get 75MB for $10. If you exceed the allowed data limits you will pay $10/75MB. For light data senior users who use their cell phones for connecting to social media, checking Email, and light web surfing the 2 GB data monthly plan, which is available for $30 per month is the best choice. 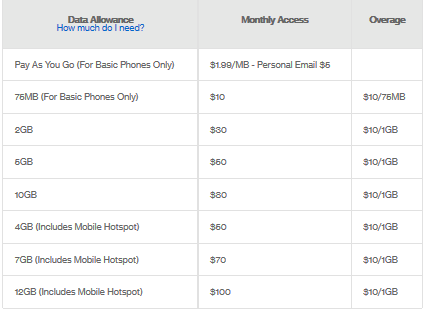 Overage charges are $10/1GB. For seniors who like browsing the web, streaming music and videos, the 5 GB data monthly plan, which is available for $50 a month may be the right start. If your usage rate is more than 5 GB a month you should upgrade to a plan with more data to avoid overage charges which are $10/1GB. Find out Does Verizon offer AARP discount? The Verizon senior plan may be an affordable deal and represents a good senior discount for the basic cell phone senior users. On the contrary, the Verizon 65 plus plan may be expensive for heavy smartphone senior users when the data plan cost is added to the voice plan cost the overall cost is high. In this case, you have to think about any of the other Verizon cell phone plans. Verizon Wireless has a wide collection of phones including almost all the iPhone models and Samsung high-end devices along with many basic cell phones. Verizon Wireless has a small collection of easy-to-use flip phones, it doesn’t have senior-friendly cell phones like the Jitterbug or Doro phones, but the available flip phones can represent a good solution for many senior citizens. Verizon cell phones for seniors are simple phones with basic flip design; they are manufactured by known brands like LG, Samsung, Kyocera. The Samsung Convoy is a rugged cell phone for seniors offered by Verizon Wireless and is suitable for senior citizens. The phone meets the IP67 and Military Specifications so, it’s a shock and water resistance device and doesn’t affect by dust. The phone has a comfortable grip and comes with a 5MP camera with video capability and auto-focus feature. The Samsung Convoy 4 is a quad-band GSM cellular handset and works inside and outside the US. Flip design phone with a 2.4-inch screen. The phone comes with a 5MP camera with video recording capability. It Meets the IP67 and Military Specifications. The phone Supports up to 32GB external MicroSD Card. The Convoy 4 is available from Verizon Wireless for $192 and $30 one-time activation fee. Another option, you can get the phone for $8 per month for 24 months and zero down payment. The LG Revere 3 is one of the best Verizon flip phones for seniors; it has a 2.2-inch primary colored display plus an external display to show calls and texts notifications. The phone buttons are designed to make the dialing and menu navigation easy. The LG Revere 3 comes with a basic camera, is hearing aid compatible, and supports Bluetooth and GPS. Let’s take a look at this flip phone features. External display to show notifications. Standard 950 mAh Li-Ion battery. The LG Revere 3 is a Verizon cell phone for seniors and is available from Verizon for $50 and $30 activation fees; also you can get it for $0 down payment and pay $2.08 per month for two years.